Bird banding demonstration at the August 2016 youth workshop. Photo by Marilú López Fretts. 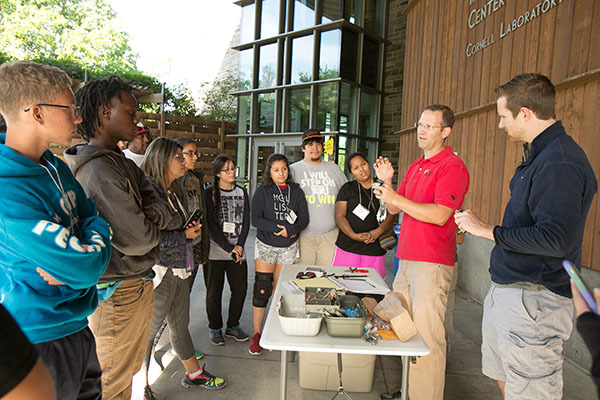 Thanks to the Thomas Cade Fund, Celebrate Urban Birds will provide full scholarships for urban youth living in underserved communities to attend a two-day Birds, Careers, and Conservation Workshop at the Cornell Lab of Ornithology August 7-8. Scholarships will cover travel, accommodations, meals, and cost of the workshop. We are looking for outstanding teens, 15-21 years old, who are interested in learning more about careers in science and conservation and who would like to have a positive impact that will benefit their community. Scholarships will be awarded on the basis of financial need and academic potential. Apply by June 10, 2018! The workshop will focus on careers in the sciences, learning about conservation science, and what youth can do in their neighborhoods to make a difference. In addition, participants will learn about Cornell, learn about cutting-edge conservation science research at the Lab, explore the value of participatory science and critical thinking, and learn about paths to higher education. Staff from seven departments at the Cornell Lab will share their expertise and time. Please see a description of a past workshop to better understand the activities offered. Once we receive all nominations and applications we will contact finalists to schedule interviews. Or email urbanbirds@cornell.edu or call 607-254-2455. Group photo after the night walk through Sapsucker Woods. Photo by Marilú López Fretts.